Free Download Games " Aggressive of Dark Combat " and Play in your Computer and Android free. Get more free game for your Computer and Android. 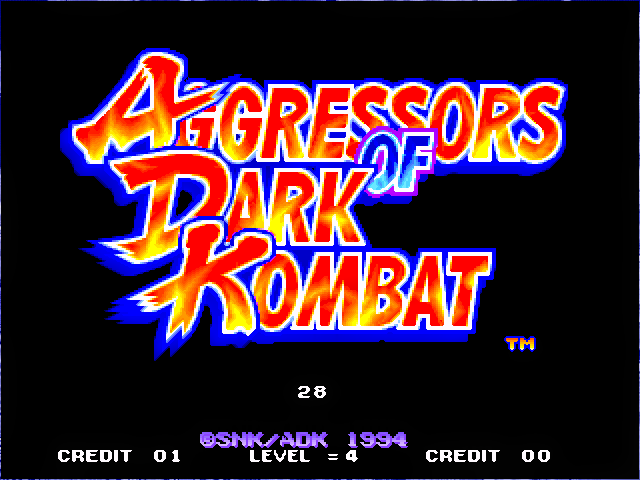 Free Download Games " Aggressive of Dark Combat "
Today I am sharing a fighting game. 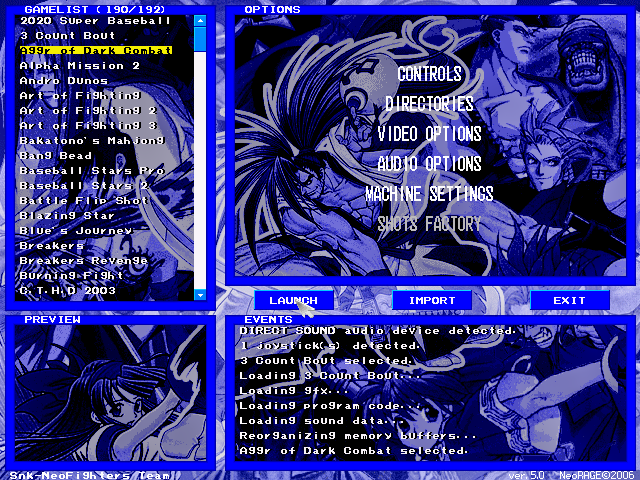 This fighting game is for Neo Geo Platform. You Can Play it in your Computer and Android. 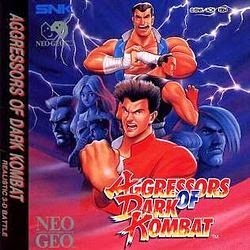 Aggressive of Dark Combat in one of the good Neo Geo fighting game. You will find 8 different player and you can select only one player. Let know the info of the Player. 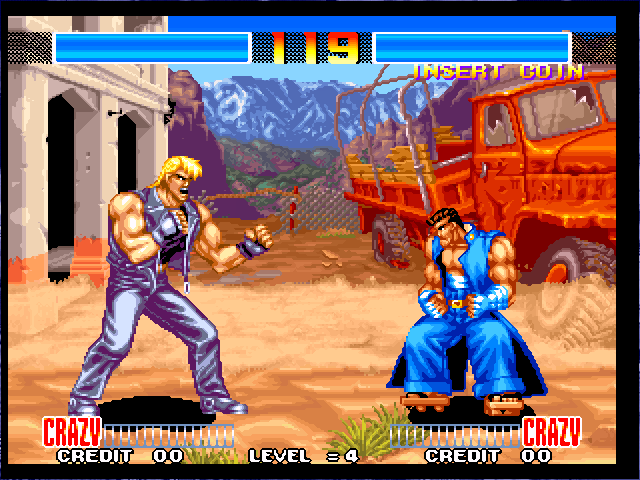 The game features eight selectable characters. 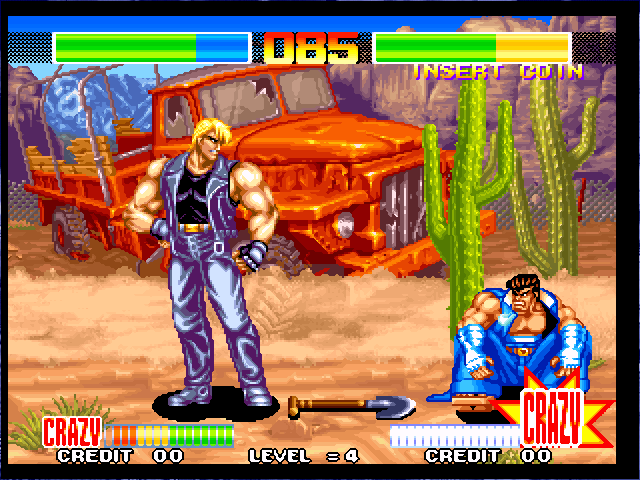 The characters are not named anywhere during gameplay, which is unusual for the genre. Seven of the characters are new to the series, but Kotaro Fūma returns from World Heroes. Joe Kusanagi (草薙　条 Kusanagi Jō) - Also known as the "Red Panther of Honmoku", he is the protagonist of the story. 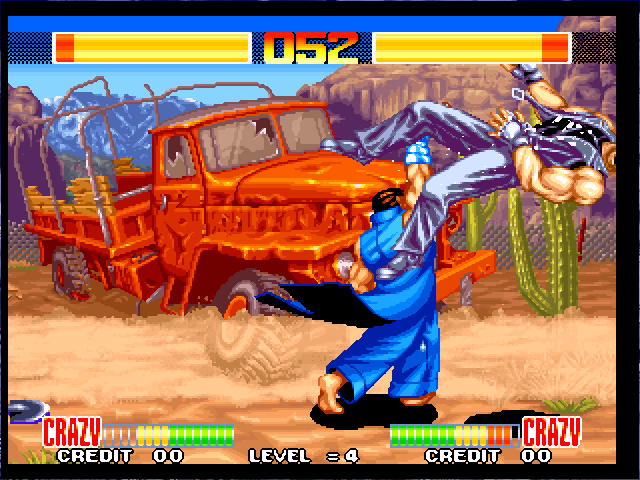 Joe is the most powerful and famous brawler of the eastern area of Japan known as Kantō. Bored from the lack of good opponents in his area, he hears rumors about strong fighters to the west, so he travels there to confirm them. 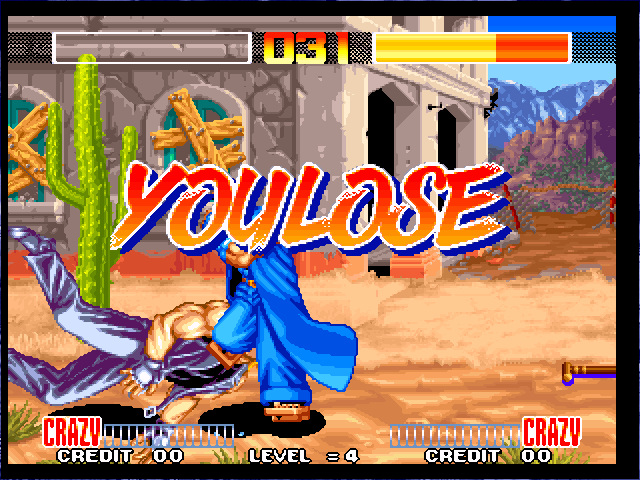 Apart from this game, he makes a cameo appearance in one of Kisarah's attacks in Neo Geo Battle Coliseum. Kisarah Westfield (キサラ・ウェストフィールド) - Also known as the "Naive Tomboy". She is an English school girl who has a reputation for being a femme fatale in Japanese schools. However, Kisarah falls in love with Joe Kusanagi and chases him to coerce Joe into being her boyfriend. She is the only female fighter in this game. 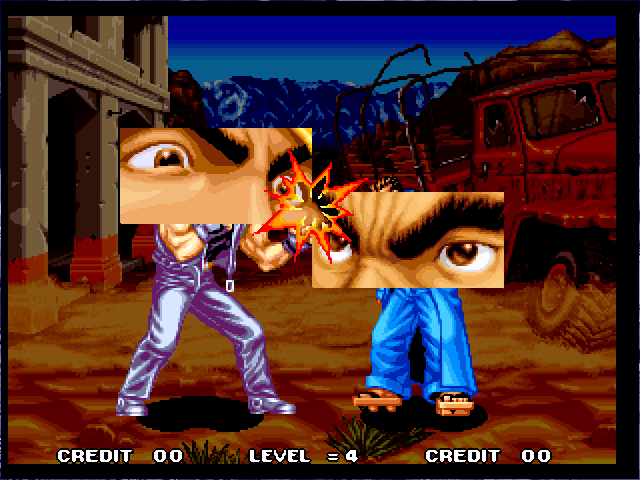 Kisarah appears as a selectable character in Neo Geo Battle Coliseum and as an SNK character card in SNK vs. Capcom: Card Fighters DS. Goh Kidokoro (城所　剛 Kidokoro Gō) - Also known as the "Strong Spirit from Naniwa". Goh is the most famous brawler in the western area of Japan known as Kansai, and has his own gang. Goh got the news about the arrival of the "Red Panther from Honmoku" and is awaiting a fight against this new menace in order to further his goal of nationwide conquest. Kotaro Fuuma (風魔　小太郎 Fūma Kotarō) - Also known as the "Angry Hurricane". His involvement in the story happens because that he got lost during one of his travels through time and landed in 1994 Japan, where the game takes place, and became involved in the ensuing fights. Like the rest of characters in the game, Fūma doesn't have powers (only his "Enryūha" signature move make the transition from World Heroes), but in exchange, he gains many combo moves. Leonhalt Domador (レオンハルト・ドマドール) - Also known as the "Black Bull". As a Mexican brawler who escapes his native country becoming a refugee, he goes to Japan to become the strongest fighter of all, no matter what for. 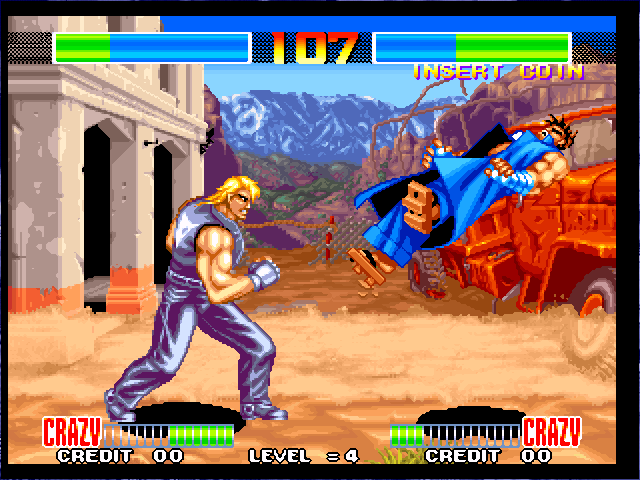 Leonhalt is the tallest, slowest and most powerful fighter from the game. His rival is Sheen Genus. Sheen Genus (シン・ジーナス) - Also known as the "Rising Tiger". He is a Canadian amateur wrestler who wants to create his own professional wrestling league, and so is searching for strong people to join him. Sheen is the wrestler of the game and a rival to Leonhalt. He has recently appeared in SNK vs. Capcom: Card Fighters DS as an Action card. Lee Hae Gwon (Korean: 이해권) - Also known as the "White Fang". A Korean martial artist who lives in Japan and works for a school. He seeks revenge against the brawler who has been causing disasters in his school: Leonhalt Domador. Lee is one of the fastest characters in the game, and has a good arsenal of kicks and various Taekwondo techniques. Bobby Nelson (ボビー・ネルソン) - Also known as the "Brown Bullet". He is an African-American boy who is a basketball player and wishes to be famous. To achieve his objective, Bobby traverses the world, waiting to be discovered. Bobby is the fastest and smallest character in the game, and the only one who always has a weapon (specifically, his basketball). He has recently appeared in SNK vs. Capcom: Card Fighters DS as an Action card, along with Sean Matsuda from Street Fighter III, who is also a basketballer. All the Player have different Combo and Super. Find how the Combo and Super works. You may use Joystick to play the game with full function of Combo and Super. If you can't download and play the Aggressive of Dark Combat game in your computer and Android, also if you can't understand the instruction follow this tow post. Those post is made with Screenshot and You Tube video so you haven't suffer and you will be success. To Know more about Aggressive of Dark Combat visit Wikipedia, Search in Google or visit the developer Website. Now Enjoy Aggressive of Dark Combat game in your Computer. Click on aodk.zip and start playing. Now Enjoy Aggressive of Dark Combat in your Android.